The all-American, 60-year-old Denny’s Diner has managed to attract a new generation of patrons by embracing the absurdity that is Tumblr. By giving its social media team the freedom to create content that’s creative, timely, and downright bizarre, it has created an atmosphere that breaks through the corporate clutter and integrates seamlessly into Tumblr’s culture of creating and sharing its own content along with its fans’ content. 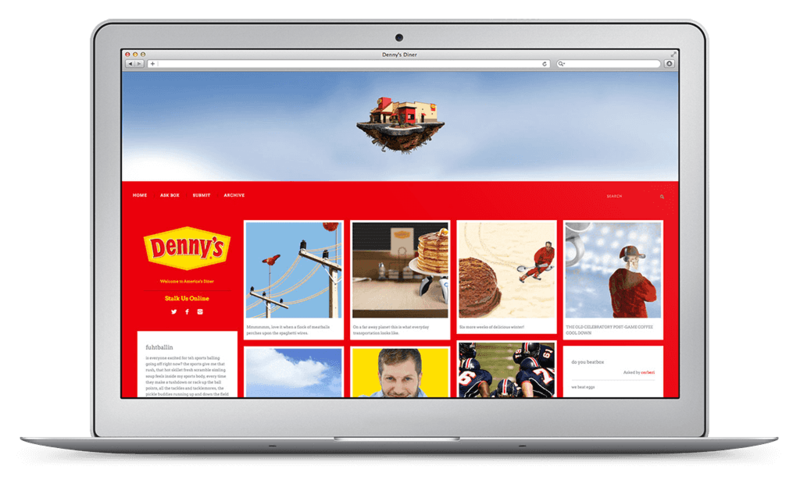 Creating daily content for Denny’s Tumblr is a challenge, but being on a talented team of smart individuals and having been given the freedom by Denny’s to just “go with it,” are the key reasons Denny’s is the most popular brand on Tumblr. Get real people creating real, regular content that’s actually fun, and you will create truly engaged fans. Denny’s Tumblr celebrates the unique and bizarre, and culture that thrives on Tumblr every single day. Denny’s takes things up a notch by creating distinctive and authentic daily content to celebrate its food and its fans. So much so, in fact, they aren’t ever truly sure if its a real Denny’s corporate account. This proves we are doing our jobs. Tumblr has stated Denny’s is the number one brand on Tumblr in terms of Community Engagement.